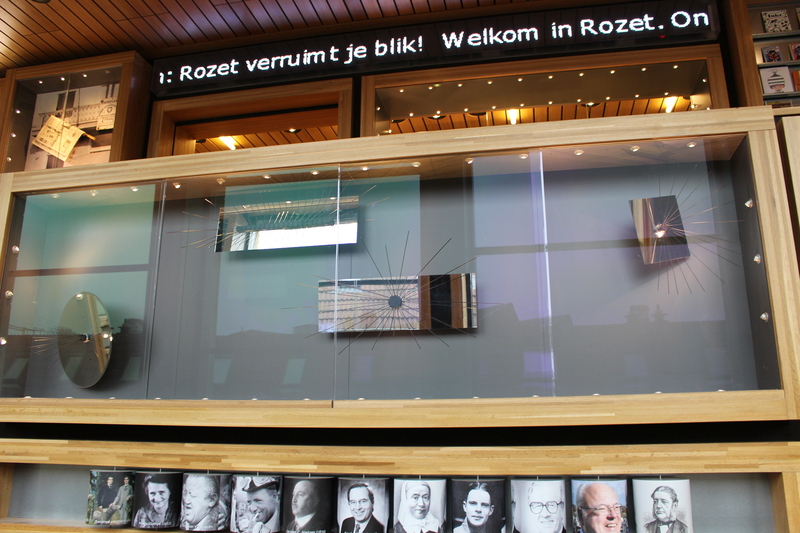 I was approached by Art Rental Gallery “toART” in Arnhem to create new work for one of their glass cases in Rozet: the noted new building in Arnhem which houses several cultural organisations such as the Library, the Heritage Centre and the Art Rental Gallery. 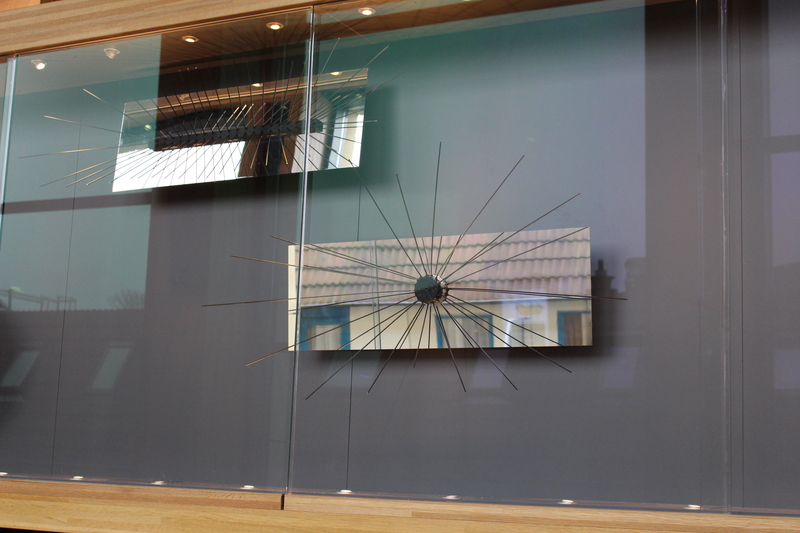 This project was especially challenging for me, as I am used to working in and reacting to much bigger spaces than the glass case, which measures 4,5 m in width by 1,3 m in height and is only 30 cm deep. After having observed the glorious architecture and wonderful (invisible) line patterns that surround the glass case, I decided to work with mirrors, which provided me with the opportunity to point to / reflect these views from within the glass case (giving me much more space to work with). 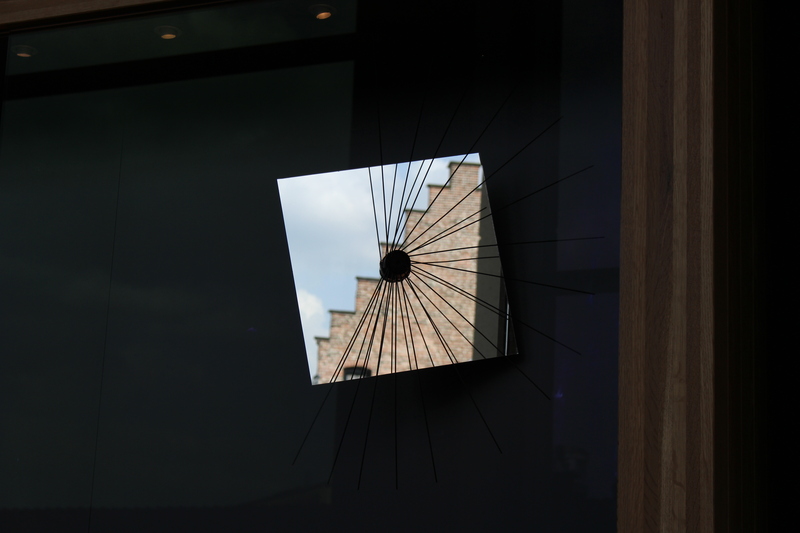 Bunches of lines have been attached to the middle of the mirrors, which point to the views reflected in these. 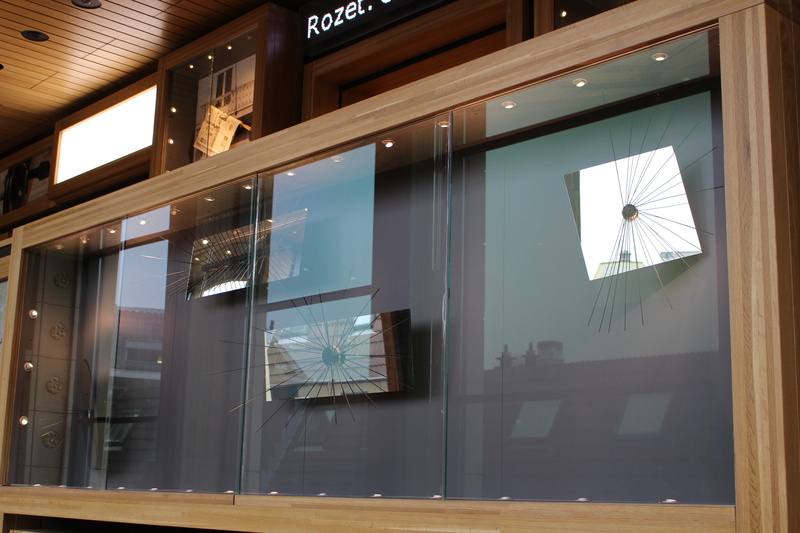 The four objects work as an installation within the glass case, and the reflected views constantly change as the visitors climbing and descending the stairs are passing the case from left to right and vice versa. No matter which views are reflected though; the bunches of wire always point to the line patterns visible in the views reflected in the mirrors. An extra layer is that these bunches are line patterns in themselves, pointing to (invisible) line patterns in the reflected views of the mirrors (which in turn also reflect the line patterns which are the bunches of wire). This work is on display all through the summer up to September so be sure to check it out if you’re in the vicinity of Arnhem. Address: Kortestraat 16, 6811 EP, Arnhem, the Netherlands. Just walk straight up the first flight of stairs and start looking up to your left.